Fancy yourself as a bit of a Miss Marple or perhaps a Sherlock Holmes? 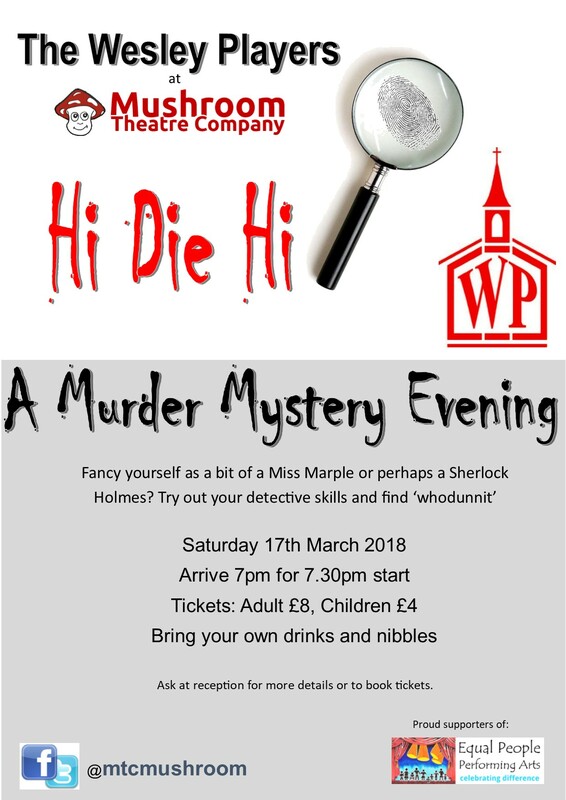 Try out your detective skills and find ‘whodunnit’ at our Murder Mystery Evening with the Wesley Players. Contact the office for more information or to reserve your tickets. It’s back! By popular demand, for one night only (until the next one) – our legendary QUIZ NIGHT! Saturday 25th February, 7.30pm, right here in our glorious studios. Tickets are just £7 per adult, with proceeds going towards the next phase of building work. Bring a whole team, or just yourself – we’ll create teams on the night as necessary. Bring your own drinks and nibbles, and come prepared for a fun night with friends! Back by popular demand, we’re holding a Quiz Night on Saturday 19 March at Equal People. As always there’ll be a prize for the winners, and lots of fun for all! Tickets are £6 per adult, and you can create your own team of up to 6, but we’ll create teams on the night for those coming in smaller groups or alone. Bring your own drinks and nibbles, and come prepared for a fun night with friends. Call 01268 906470 to book, or for more information, or speak to us on reception. Thinking of sorting out your wardrobe to make room for Christmas presents? We can turn your unwanted clothes into cash for Equal People PA.
Drop your bags of clothing off at the Studios – we can accept clean clothing and shops, but not socks or underwear. With all the excitement of the show, we’ve not made much fuss of Penni’s upcoming birthday and our Charity Chinese Night, but it’s not too late to reserve your place! A mere £15 will get you an “all you can eat” buffet at East in Southend (http://www.east-restaurants.co.uk/), with great company! We’ll meet there at 7.30pm and although we’ll also be celebrating Penni’s birthday there is a strict “no present” policy. You’re welcome to make a donation to Equal People PA, but there is absolutely no obligation. The Fundraising Team work tirelessly throughout the year arranging various events and activities, but we’d love to hear from anyone who would like to get involved, whether on a regular basis or just to help with a single event!